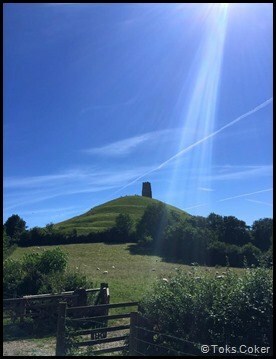 6. the Tor Goddess, rises out of the landscape of Glastonbury, tall, majestic, you cannot ignore noticing it. for me she is the Goddess of Love, Sexuality, Pregnancy and Hope. Walking up the land is torturous and dangerous with the cold wind, small paths and deep drops, yet once done you feel a sense of achievement and empowerment that you did it! She is Aphrodite, Venus, the Morning Star, the Evening Star. She is all and one. She demands your full attention and then releases you. She is all and nothing at once. She is passion, sexual urge, ovulation and seedingall at once. She is our desire for more connection. She holds the wisdom of your Soul ready to reveal it to you when you are ready. She is you. She is me. She is everyone at once and no one too. She rides naked on a horse shameless, like Lady Godiva. She is the woman complete in herself whether Virgin, Maiden, Lover, Mother, Crone. She is Mother Earth. We can go underground to the underworld through one of the slopes of the Tor. Some of my friends did that and saw a group of ladies bathing in the underground of the Thor. 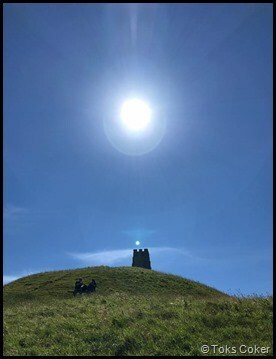 The labyrinth within the Tor is real and wonderful. Writing down my new moon wishes privately gave me a chance to reflect on what’s been happening and what Iwant nest. If thoughts create things, how often are you thinking about what’s gone wrong? I know I do this, and I’m very good at over-analysing. Time to stop the crazy voices in my head. Being in my own space with the meditation group gave me time to take a step back and look at my own life. As I focused on what was truly important in areas of health, business and relationships I wrote down my new moon wishes. My intentions for the next two weeks from the new moon to the full moon.